UNITED NATIONS, August 12 -- After the Sri Lankan Army shot and killed protesters of water poisoned by the Hayleys conglomerate in Weliweriya, Inner City Press has twice asked the UN in New York if Secretary General Ban Ki-moon has any comment. After not being allowed to ask this Sri Lanka question on August 1, on August 2 Ban's spokesperson Martin Nesirky said he'd check if there was a comment. When Inner City Press asked again, Ban's Associate Spokesperson Farhan Haq on August 9 told Inner City Press, still no comment. See August 9 video here, from Minute 5:02. On August 10, a Buddhist mob attacked a mosque in the Grandpass section of Colombo, and after that a curfew was declared. And what did the UN's Mr. Nandy speak about? He read from UN scripts about Youth Day; he gave "stress relief" suggestions: go for a run, do tai chi. Is mosque burning a stress relief technique? Killing civilians? These answers debased the UN system. Not only UNDP in Sri Lanka, but other agencies like UNFPA's Lene Christiansen and UNICEF's Reza Hossaini, got in on the act. Certainly there are constraints in being the UN in today's Sri Lanka. But the UN in New York's no comment on the live fire, and silence on the mosque attack, put these agencies in this absurd position. Thirty seven days ago, Ban's deputy Jan Eliasson told Inner City Press he was near to completing his report on what the UN should learn from its actions (and inaction) during the slaughter in Sri Lanka in 2008 and 2009. On August 2, as it had tried to on August 1, Inner City Press asked Nesirky for the status of the report, and if and when it will be made public. Video here, from Minute 13:43. Can it take so long to study this report? September? We intend to be here, despite a threat by the UN Department of Public Information to suspend or withdraw Inner City Press' accreditation for merely hanging the sign of the new media freedom organization the Free UN Coalition for Access on the door to its shared office. After rather than defending media under fire UNCA chose to further target it, the Free UN Coalition for Access was formed to defend journalists. 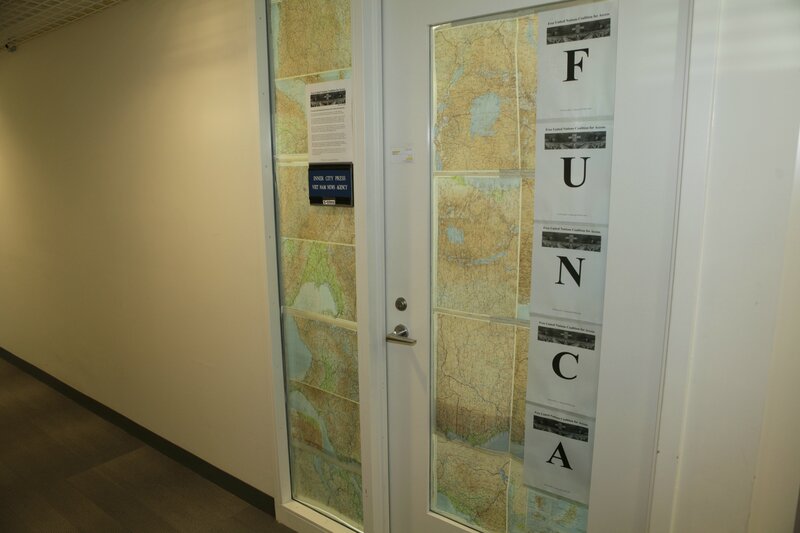 Now this UN targets FUNCA. Nesirky on August 2, when Inner City Press asked about threats to journalists seeking to cover the Commonwealth Heads of Government Meeting in Colombo. said that Ban thinks journalists should be able to do their work without obstacle or intimidation. The UN's Mr. Nandy's blithe blather about Youth Day echoed the non-responsiveness of the UN's DPI in New York, where when asked about declining media access and working conditions to cover the General Assembly when Ban was reading answers about Youth Day, DPI has entirely ignored the issues and questions from @FUNCA_info, and kept on tweeting photos of Ban, and comments about the Clintons, welcomes to Ambassador Samantha Power. Meanwhile social media trolling started again on August 10 from DPI's ongoing UN Censorship Alliance, which previously pushed, including by spying for the UN by first vice president Louis Charbonneau of Reuters, to get Inner City Press banned from the UN. Without obstacle or intimidation. Really? Watch this site.